My first recollection of the taste of boerewors was as a child, our Saturday lunch always consisted of boerewors and chips (French Fry's) and which by the way are a great combination! Then of course growing up in the Karoo there were many, many braais with boerewors and chops as the main course. 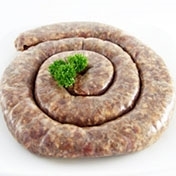 There are several rules regarding real boerewors, it must firstly contain at least 90% meat and preferably be a blend of beef and pork and/or mutton (lamb) along with some diced spek (fat back) which is added to promote the flavor and texture, the sausage should be coarse ground and all important it must have a spice mixture which contains coriander, nutmeg and cloves along with brown vinegar. In the north of the country South Africans like a bit of stywe pap with their wors (pap en wors) which is traditionally served with a tomato and onion relish topping and of course boerie rolls served with Mrs Balls Chutney or sautéed tomato and onions are available and sold at every public function from church fairs to rugby matches, I personally like my boerie roll with a dash of peri-peri sauce. 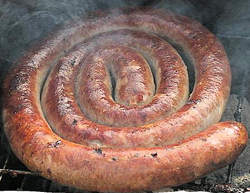 Grabouw wors is legend back in SA however the best boerewors I ever ate was back in the 1970's, we obtained this from a butcher called Glen Lilly which was located in the northern suburb of Bellville in the Cape however I was told by someone in the know that the boerewors was actually produced in Malmesbury. Glen Lilly wors was greyish in colour and had the characteristic of shrinking considerably after grilling which must have been due to a high fat content but it had an excellent and distinguishably unique flavor and was in high demand in the northern suburbs of the Cape peninsula. There are many flavor variants in South Africa when it comes to boerewors such as curry, sosatie, garlic, monkey gland, peri-peri and also tomato & onion however the nostalgic flavor of traditional wors is quite unique and nothing quite compares to a summer evening standing gazing into the red coals of a braai with beer in hand, good company and the mouth watering aroma of traditional boerewors wafting through the evening air. Oh indeed those were the days and may the wors be with you !